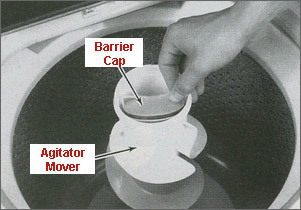 The purpose of the agitator is to provide a proper washing action by moving the water and clothes around the basket. Note: Most agitator problems could be fixed with this inexpensive Agitator Repair Kit (instructions included). 2. 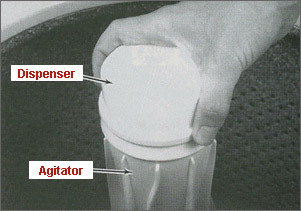 Pull the liquid fabric softener dispenser up (if used), to remove it from the top of the agitator. 3. 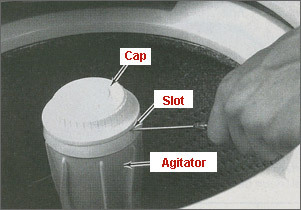 Insert a small screwdriver in the slot between the agitator and cap and pry the cap off the agitator. 4. Reach in and remove the barrier cap and gasket by pulling up. 5. 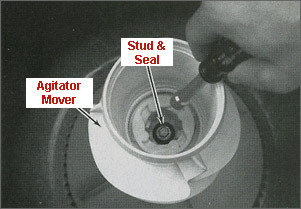 Using a socket wrench (with extension) or nutdriver, remove the stud and seal which holds the agitator to the shaft. 6. 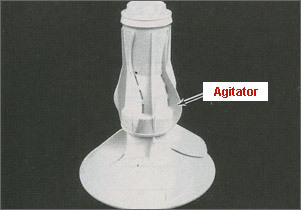 Remove the agitator mover by pulling this up off the agitator. 7. Turn this agitator mover over so the camp and clutch dogs (4 pieces) slide out. 8. 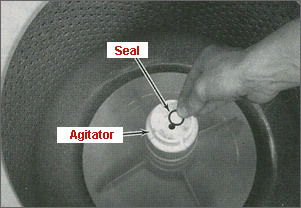 Carefully remove the round rubber seal off the top of the agitator. 9. 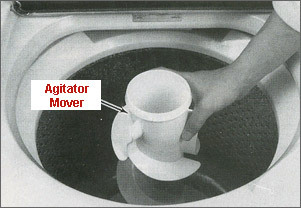 Carefully remove the agitator by lifting straight up. 10. Inspect the agitator shaft for worn grooves or rust. If the shaft is bad (rare), either call an appliance repair company to repair this or replace the complete gearcase yourself. 1. Place the new agitator on the shaft. 2. Rotate the agitator until the grooves in the agitator match the grooves on the shaft, and push the agitator down. 3. 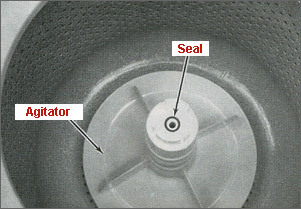 Place the new round rubber seal in the groove on top of the agitator. 4. Hold the new camp upside down. 5. 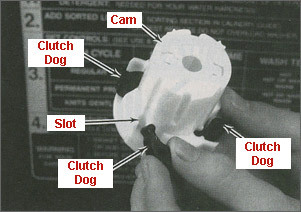 Place the small round part of the new clutch dog (4 pieces) in the slot on the cam. 6. Do the same thing to the other three (3) clutch dogs. 7. 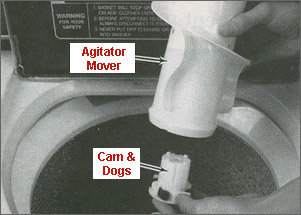 Turn the agitator mover over and carefully insert the cam and dogs, up into the agitator mover until the camp stops. 8. Carefully turn the agitator mover upright. Note: The cam has a cutout and tabs across from each other. The agitator has tabs across from each other. These must line up in order for the came to slide down on the agitator. 9. 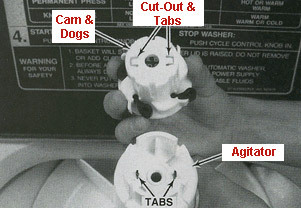 Place the agitator mover, cam, and dogs over the agitator while lining up the tabs. Note: If the dog(s) falls out of the slots(s) in the cam you will have to repeat steps 4-9. 10. Push the cam down until the tabs snap together. 11. Push the new auger agitator on the shaft. 12. 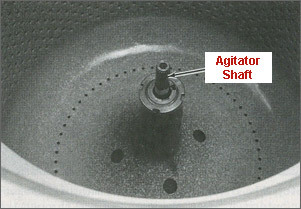 Rotate the agitator until the grooves in the agitator match the grooves on the shaft, and push the agitator down. 13. 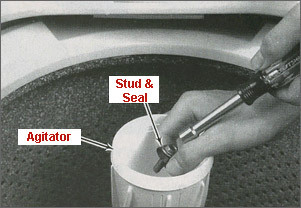 Using the socket wrench (with an extension) or nutdriver, insert the stud and seal through the agitator, into the shaft, and tighten. 14. 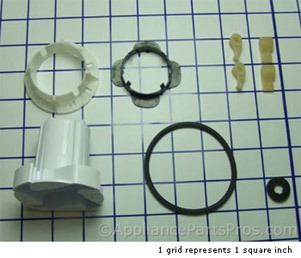 Be sure the round gasket is in the groove in the barrier cap. Note: The barrier cap must be pushed down past the holes in the mover, so the liquid from the dispenser can flow out of the holes. 15. 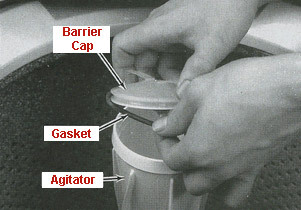 Push the barrier cap and gasket all the way down into the agitator mover. 16. Press down on the liquid fabric softener dispenser or cap, which ever you have, until it is all the way down on the agitator.